I’ve had to crawl out of my hole to write this. It’s been a while since I have blogged: mainly because I have gone back to work full-time and simply do not have any energy to expend on this awesome hobby of mine and also because, it has to take somewhere really special for me to bother to write about it. So, Kimme. Am I still raving and salivating at the thought of a repeat visit? Well, not to that extent, but good enough that I would like to revisit with my hubby someday soon. Speaking of hubs, he was away on his own gourmand journey in San Francisco, so left to my own devices, and hell bent on not spending Friday night alone, I called up an ex-Straits Times alum of mine, and headed off to Kimme. Now this ex-journo friend of mine puts the pressure on me whenever we meet. She is reliant on me to suggest places that I love, but I, on the other hand, always want to check out new places, which might end up being a hit or bust. Luckily, Kimme turned out to be a hit. 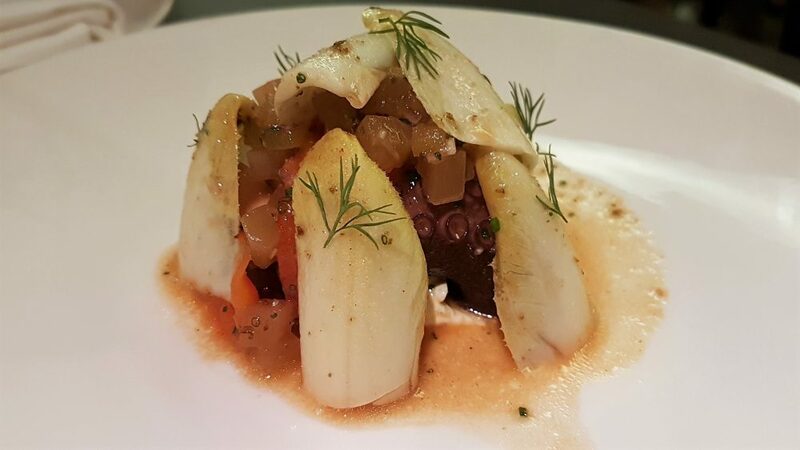 Opened by Michelin-starred Meta’s head chef, Sun Kim, the stylish, rather spaceship-like, restaurant is located at Amoy Street. Why I say spaceship is simply because when you walk in, curved walls cocoon you, with the open kitchen, all stainless steeled and pristine, just making you feel kind of… enclosed. Not to say that it’s claustrophobic, though if you have a social phobia, best you head on upstairs, because on the ground floor is a large, communal table, normally occupied by chatty, pretty people. Upstairs, separate dining tables are placed relatively close together, but that just adds to the buzzing vibe, matched by the friendly staff. They are nice, but not overbearing, introducing the menu and specials, without unnecessary aplomb. We selected the Spanish Octopus, Endive, Salsa and Dill ($24) and the Shima Aji Tartare, Caviar, Egg ($30) to start. 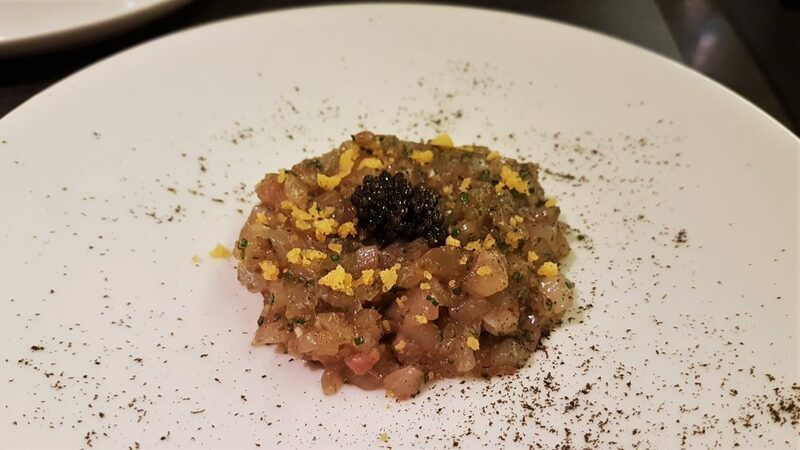 They were both light and flavourful bombs, I enjoyed the fragrance of dill in the octopus dish, somewhat uncommon, and of course, tartare is a great way to show of the clean, fresh taste of the shima aji, which with the salty pearls of caviar and punchy taste of sesame, was very enjoyable. Still sticking with the sea theme, our next dish was the Spanner Crab and Seaweed Linguine ($25). 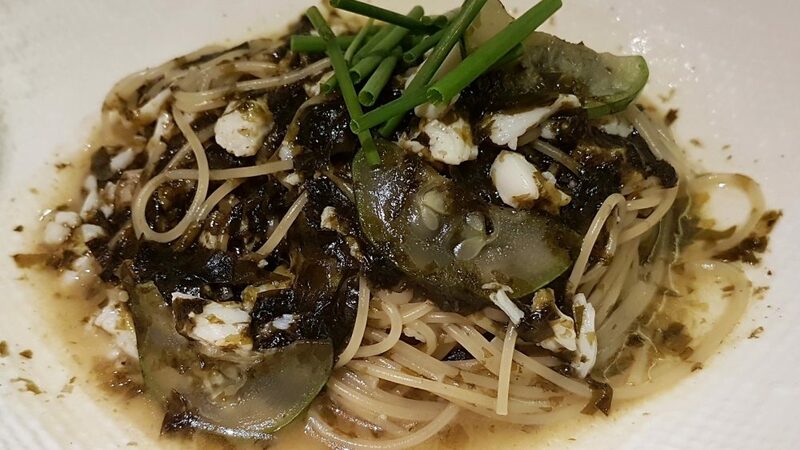 Again, rather unique flavours, strong seaweed taste with the mildly sweet crab meat, in a broth that my friend described as being “homey”. Without a doubt, our dish of the night had to be the Australian Wagyu Striploin ($45). 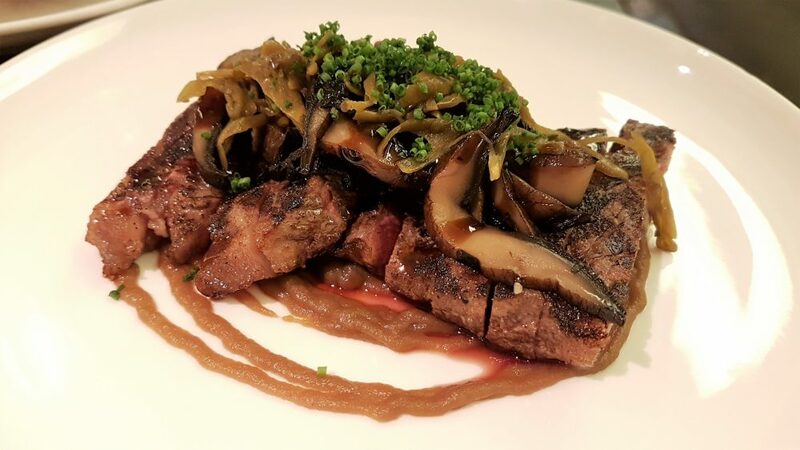 The beef was cooked just the way we liked it, perfectly medium, and the meaty mushrooms and sweet onion puree just made the dish all the more robust. We had no room left for dessert but all in all, yes, Kimme gave my gal pal and me a great night, and enjoyable enough a dinner for me to bring the fiercest critic back for the next time – my dear hubby.